The latest results from the SPIVA U.S. Mid-Year 2018 Scorecard show improvement in the relative performance of actively managed domestic equity funds against their respective benchmarks. During the one-year period ending June 30, 2018, the overall percentage of all domestic funds outperforming the S&P Composite 1500® increased to 42.02%, compared with six months prior (36.57%). During the same period, 63.46% of large-cap managers, 54.18% of mid-cap managers, and 72.88% of small-cap managers underperformed the S&P 500®, the S&P MidCap 400®, and the S&P SmallCap 600®, respectively (see Exhibit 1). Exhibit 2 shows that, among the three market cap segments, small cap (20.50%) was the best performing segment over the 12-month period ending June 30, 2018. 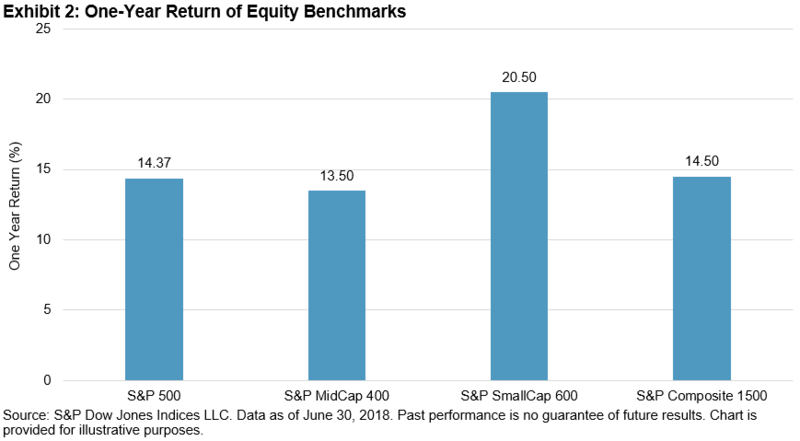 Nevertheless, compared to active managers in the large-cap and mid-cap segments, more small-cap managers underperformed their benchmark, the S&P SmallCap 600. This finding dispels the myth that small cap is an inefficient asset class in which active management offers the best solution to access. 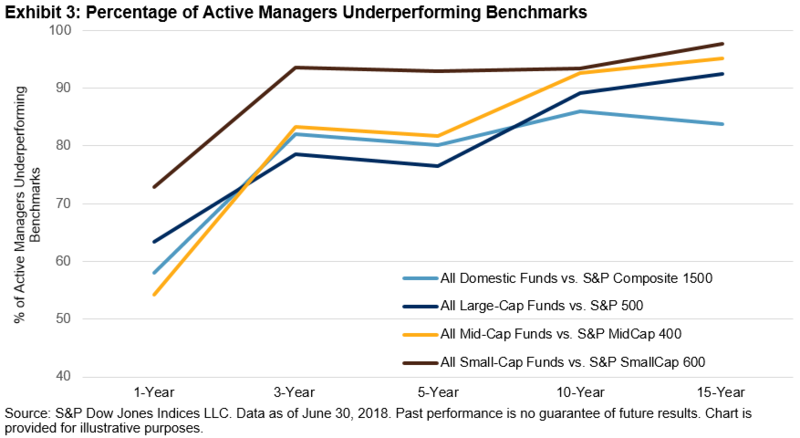 Year after year, the SPIVA U.S. Scorecard has repeatedly shown that the majority of small-cap active managers have underperformed the S&P SmallCap 600, and this trend can be seen in all the periods studied. 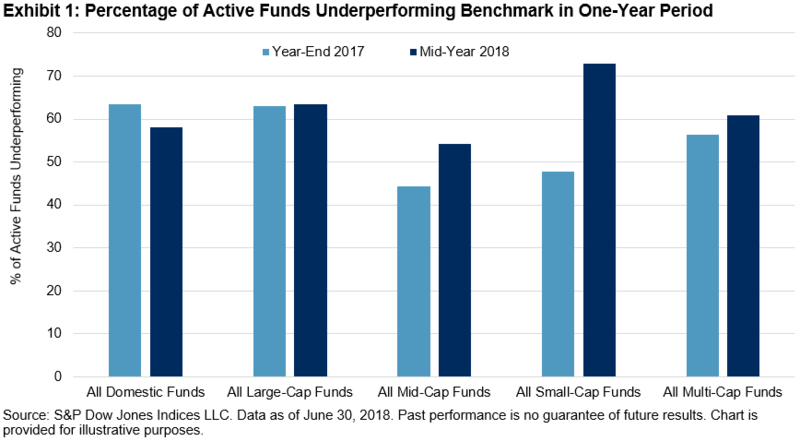 While the near-term performance of active equity funds improved, the majority still underperformed their benchmarks over the medium term as well as the longer-term investment horizon (see Exhibit 3). For example, over the five-year period, 76.49% of large-cap managers, 81.74% of mid-cap managers, and 92.90% of small-cap managers lagged their respective benchmarks. Similarly, over the 15-year investment horizon, 92.43% of large-cap managers, 95.13% of mid-cap managers, and 97.70% of small-cap managers failed to outperform on a relative basis. Similarly, across all investment horizons measured, managers in each of the international equity categories underperformed their benchmarks. Furthermore, the longer the time horizon, in general, the more funds underperformed. Over 94% of active emerging market equity funds and nearly 79% of international developed equity funds underperformed when measured over the 15-year horizon. Similar to our findings in the U.S. small-cap space, emerging market equities is also another asset class where conventional wisdom dictates using active management to access. However, as the SPIVA U.S. Scorecard results have repeatedly shown, an overwhelming percentage of active emerging market equity managers have difficulty beating their benchmark. It is also worth noting that compared to the results from six months prior, more international equity managers underperformed their benchmarks in the one-year investment horizon, especially in the international small-cap category. When it comes to fixed income, during the 12-month period ending June 30, 2018, the majority of actively managed funds investing in long-term government and long-term investment-grade bonds underperformed their benchmarks, but their relative performance over the benchmarks improved compared to six months prior. In contrast, funds investing in short- and intermediate-term investment-grade bonds outperformed their benchmarks. Experience the active vs. passive debate on a global scale on Indexology®.